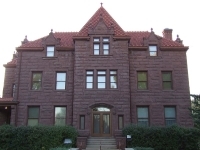 Listed on the National Register of Historic Places, Moss Mansion was the home of the Preston Boyd Moss family built in 1903, and has been preserved to capture the family life of the well-to-do of the era. The house was designed by New York architect, Henry Janeway Hardenbergh, whose best-known work was New York's Waldorf Astoria. Most of the original fixtures are still in the house which visitors can view during informative guided tours of the property. Opening times: Tuesday to Saturday 10am-3pm, Sunday 1pm-3pm. Guided tours take place every hour. Admission: $10 adults, $6 children 6-17. Group rates and other concessions are also available.